Something of a rivalry has developed between fellow Nine personalities Clive Robertson and Ray Martin, following remarks that Robertson made on The World Tonight about his Midday counterpart. Robertson’s comments were made in response to a letter asking him to open “a fete or something”. “What I said was, ‘You really need someone who’s used to that sort of thing, like Don Burke or Ray Martin — or Jana (Wendt) might do it’,” Robertson told TV Week. 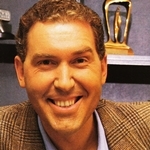 “You’d agree there’s nothing offensive about that, right?” He then recalls that Martin, who was filling in for Wendt as host of A Current Affair, later approached him: “He said, ‘I don’t want open fetes and I don’t want to use the Jana show and I don’t want you to mention me again’. I thought he was joking and said I wasn’t having a go at him at all. I asked what if I did mention him again and he said, ‘I’ve got that covered — I’ll thump you!’.” And Martin doesn’t deny the exchange took place. “Clive said, ‘If it has that much effect, I should do it again’, to which I replied, ‘Don’t, because I’ll smack you in the mouth!’. If he wants to know if I’m fair dinkum, just let him do it again,” Martin told TV Week. 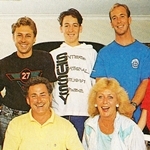 Sixteen-year-old Michael Baker (pictured, centre) talks to TV Week about his his family’s life being played out in front of the cameras as part of the ABC-BBC co-production Sylvania Waters, which debuted on ABC last week. “The soaps show all the good sides to family life, but you never see the bad,” he said. “You don’t see all the big arguments, only happy times. At least when our family argues, we have the ability to have a stronger relationship at the end than before. The family previewed the first episode at the ABC’s viewing room… and we couldn’t stop laughing. We’re definitely not average — you can see how we live — but we are typical.” Sylvania Waters was six months in the making, following the life of Michael, his mother Noeline, stepfather Laurie and their extended family. The series will debut in the UK later in the year. Steve Vizard (pictured) and Andrew Knight, whose company Artist Services produces Fast Forward, Tonight Live and Bligh for the Seven Network, have struck up a new production deal with the network. The company has the go-ahead to produce a comedy-drama telemovie later in the year. The new project, Jobs For The Boys, will be co-financed by companies in New Zealand and Europe. Artist Services also has four new sitcom projects in development, although one series, a radio-themed comedy called Turn It Up starring Marg Downey, was knocked back. Vizard is confident, however, that Bligh will be renewed for a second series. Wheel Of Fortune host John Burgess is considering a move from the afternoon game show to pursue his long-time goal of becoming a newsreader. Burgess tells TV Week he is seriously looking at the prospect of reading news “somewhere on the east coast” in 1993. Seven‘s celebrity bath-mat Agro has revealed the new love of his life, Loo-Loo. The pair (pictured) made an appearance on a recent episode of game show The Main Event. 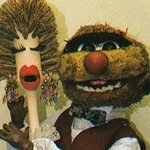 “She’s no scrubber,” Agro says. While Seven has over 300 hours of coverage of the Olympic Games from Barcelona, SBS has its own unique take on the event with Zoo Olympics, a nightly two-minute cartoon featuring animated characters competing in events like Egg Laying, Kangaroo Boxing, Sheep 10,000-metres, Bobsled for Turtles and Snake Racing. Zoo Olympics is to screen at 6.28pm, leading into World News, for the duration of the Games. The Games Of The XXV Olympiad: On Sunday afternoon, Seven presents a repeat telecast of the opening ceremony of the Games Of The XXV Olympiad from Barcelona, before starting its coverage of Day One of competition from 5.00pm before breaking for Seven Nightly News at 6.00pm and then returning to Barcelona at 6.30pm for coverage through to 7.00am Monday morning. Weekday coverage starts with the two-hour Games Roundup (7.00am), followed by four hours of highlights (12.00pm) and then resumption of direct coverage of competition from 4.00pm to 6.00pm, and then from 7.30pm through to 7.00am the following morning. On Saturday, highlights are screened from 9.00am through the commencement of the next day’s competition at 4.00pm. Sunday: Actress Greta Scacchi is the guest on this week’s Sunday Afternoon With Peter Ross (ABC). New Faces With Bert Newton (Ten) presents a special junior talent contest. Sunday night movies are Murder In Boston (Nine) and Rambo III (Ten). Monday: In Healthy Wealthy And Wise (Ten), Iain Hewitson goes to the Sydney fruit and vegetable markets and makes savoury pancakes, while Jim Brown visits the Alice Springs Bush Restaurant. SBS winds up its coverage of the Tour de France with its final half-hour highlights package. Tuesday: In GP (ABC), Michael (Brian Rooney) is confronted by the fantasy of instant wealth and the reality of testicular cancer. In Sylvania Waters (ABC), Laurie and Noeline are fighting ahead of the family gathering for Christmas lunch. 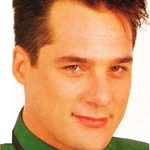 In a two-hour episode of Chances (Nine), Dan (John Sheerin) has a shock announcement for Barbara (Brenda Addie), while Sean (Stephen Whittaker, pictured) is told he must deliver the Eva Braun necklace to Sieglinde Steiner of the April Corporation, but in doing so he must double-cross Lily (Katherine Li). Wednesday: In Cluedo (Nine), when Harold Phelan (Simon Chilvers) comes to Brindabella in search of his wife, it seems that this smooth-talking politician has a hold over several of the household members. Thursday: In Embassy (ABC), the Australian Government is considering selling arms to Ragaan’s neighbour, Mendakka. In E Street (Ten), CJ (Adrian Lee) tells Toni (Toni Pearen) that the wedding is off. Friday: Documentary series Track Record looks at the development of luxury express train the Spirit of Progress. Source: TV Week (Melbourne edition), incorporating TV Times and TV Guide. 25 July 1992. Southdown Press.